This chapter begins by situating a narrow public health focus in medical humanitarianism despite the changing nature of conflicts. 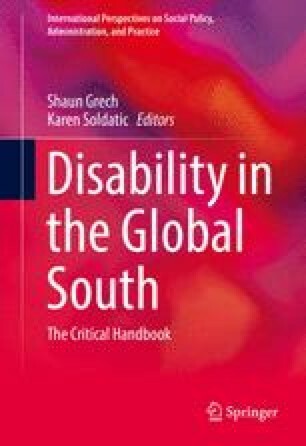 We argue that such an approach misses existing populations of disabled people, which has consequences for reintegration and social protection. Secondly, we examine how indirect impairments result from sites of vulnerability during and post-conflict. Thirdly, we illustrate the long-term consequences of conflict and where action is needed. In conclusion, we use a case-study to examine the potential of inclusion as a resource for peace but also show why this approach currently has limitations. We would like to thank the reviewers for their detailed editing and helpful comments. Hersey, L. (2001). Interview with Dr. Nawaf Kabbara. Disability World, 8. Retrieved from http://www.disabilityworld.org/07-08_01/il/kabbara.shtml. Accessed 24 Apr 2014.